This class demo and job talk will feature, Vivek Narayanan, who has taught history, anthropology, and creative writing in many places, including the University of Kwazulu-Natal in Durban, South Africa, and the Center for the Study of Developing Societies in New Delhi. Narayanan was born in India and raised in Zambia, and earned an MA in cultural anthropology from Stanford University, and an MFA in creative writing from Boston University. He was a Fellow at the Radcliffe Institute, Harvard University (2013-14) and a Cullman Fellow at the New York Public Library (2015-16) while working on a book of poems about the ancient Indian epic poem Ramayana. 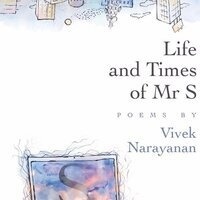 His books of poems include Universal Beach (Harbour Line Press, 2006/In Girum Books, 2011) and Life and Times of Mr S (HarperCollins India, 2012). A full-length collection of his poems in Swedish translation was published in 2015 by the Stockholm-based Wahlström & Widstrand. He is co-editor of Almost Island, a nine-year old India-based journal, literary organization, and publisher. His essays, criticism, and poetry have appeared in Agni, Granta, The Village Voice, Harvard Review, Caravan, and elsewhere, and his poems have been included in anthologies such as The Bloodaxe Book of Contemporary Indian Poets (Bloodaxe), The Oxford Poets Anthology 2013 (Carcanet), 60 Indian Poets (Penguin), and Language for a New Century (W.W. Norton). A brief Q&A will follow the job talk.